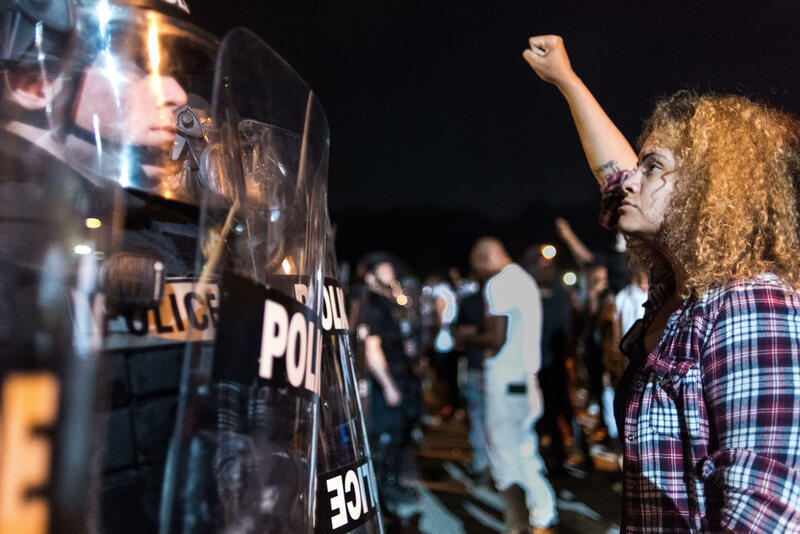 CHARLOTTE -- Civil liberties advocates in Charlotte, North Carolina are calling on investigators there to release video of the fatal police shooting Tuesday of 43-year-old Keith Lamont Scott, which set off violent clashes between protesters and the community. The shooting comes just before a new law goes into effect in the state excluding police camera recordings from the public record. Starkly different pictures emerged overnight Tuesday of Scott’s shooting. Scott’s sister said he was unarmed and was reading a book while waiting for his son to get off the school bus, when police approached and shot him. But Kerr Putney, chief of the Charlotte-Mecklenburg Police Department, said Scott had a gun in his hand when he was shot by police officers. “In the interest of transparency and accountability, and particularly in light of conflicting accounts about the shooting, the Charlotte-Mecklenburg Police Department should quickly release any and all footage it has of the events leading up to the shooting, as well as the shooting itself,” the ACLU of North Carolina said in a statement released Tuesday. The ACLU’s call for the videos has also been echoed by advocates on social media. A controversial bill signed into law Gov. Pat McCrory in July would prevent law enforcement agencies from releasing video footage without a court order, but the law does not take effect until Oct. 1, the ACLU said. Calling the law “disgraceful,” the ACLU said the video would provide crucial evidence of what took place. “Charlotte should set an example for North Carolina by releasing footage of the shooting promptly before the obstacles imposed by the new state law take effect,” the statement read. CBS News has also filed a request for the videos from the Charlotte-Mecklenburg Police Department. Speaking Tuesday, Putney said the video of the incident is being reviewed. The officer who fired the fatal shot was not wearing a body camera, he said, but other uniformed officers on the scene were. The ACLU also called on the department to explain why the officer who shot Scott was not wearing a body camera. Putney said the video wouldn’t be released right now, calling it evidence in an ongoing investigation and citing the video law. “It would have a negative impact on the case and right now that’s something we can’t do,” he said. The new law puts North Carolina among about a half dozen states that specifically exclude body and dash cam recordings from open records laws. Republican Gov. Pat McCrory signed the law in July. It allows a person who appears in a police video to ask to view the recording, but not copy it. Law enforcement agencies can deny such requests, citing concerns about safety, reputation or an ongoing investigation. Then it would be up to a judge. McCrory has said the law taking effect Oct. 1 walks the fine line between transparency and citizen privacy. “The bill is a common sense approach and balance between respecting the rights of our police officers while also balancing the need for the public needs to know,” he said in July. The law passed with overwhelming support from the GOP-dominated General Assembly, and is supported by the state’s sheriffs’ and police chiefs’ associations. They said it will increase transparency because it clarifies the recordings are not personnel files, which are nearly impossible for third parties to access. But civil liberties groups including the ACLU and social justice activists said the law will make holding officers accountable more difficult. “At a time when people across the country are calling for greater transparency and accountability from law enforcement agencies and officers, Governor McCrory’s bill to keep police body camera footage hidden from the public moves us in the wrong direction,” state Democratic Party chairwoman Patsy Keever’s statement said in a July statement. North Carolina Attorney General Roy Cooper, the Democratic challenger for governor, has also said the law goes too far. On Tuesday, Putney said officers were executing a search for a man with outstanding warrants when they witnessed Scott get into a car with a handgun. Scott was not the man they were looking for, but police engaged him when he then got out of and back into the car with the gun, Putney said. Officers approached Scott and gave him multiple warnings to drop the weapon, Putney said. Scott then attempted to get out of the vehicle with the gun in his hand, which is when he was shot by Officer Brentley Vinson, who is black and has been placed on administrative leave, as is standard procedure in such cases. Vinson has been with the department for two years. Putney said officers called for medical help immediately after the shooting. He said he hoped a thorough explanation of the shooting will help calm the unrest in the city. The video has already been viewed more than half a million times and shows frustration building from members of the community, looking for answers. “A life has been lost today, a life was taken and y’all want to block everybody out!” one community member said in a Facebook video.